Chocolate Pecan Pie. 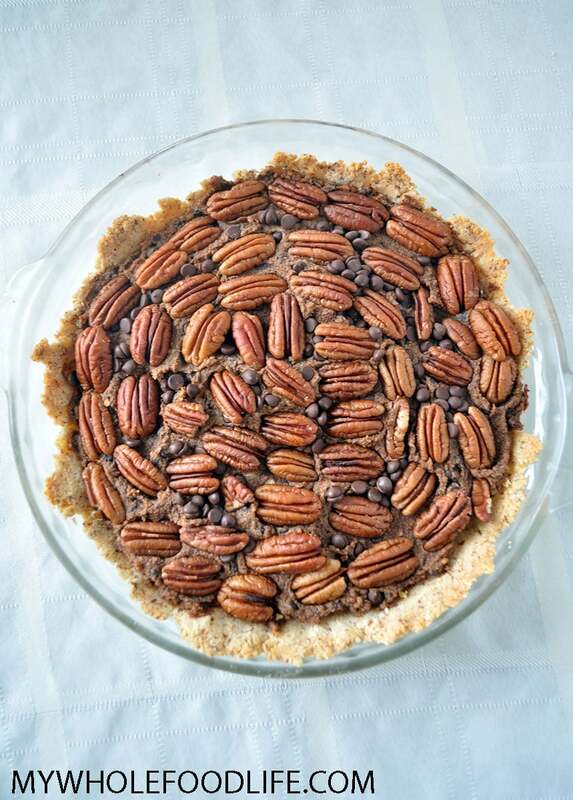 If you are still struggling with what dessert to serve for Thanksgiving, I got you covered with this healthy vean pecan pie. Not only is this delectable pecan pie made healthier, but it’s also vegan, gluten free and grain free. If you love pecans, you may also like my flourless cinnamon pecan cookies, pecan pie granola, or my classic pecan pie recipe. This happens to be super easy to make as well. You can make this ahead of time too. This would be awesome topped with some coconut whip cream, or served with a side of my pecan caramel ice cream. Yum! Looking for more healthy pie recipes? Chocolate Pecan Pie made healthier! Press mixture into a glass pie dish . Bake for 10 minutes and set aside. In a food processor , add the pecans and chocolate chips. Mix for 1 minute. Then add the dates and mix for another minute. Lastly, add in the remaining ingredients and mix until smooth. Spoon mixture into the crust in the pie dish. Garnish the top with extra pecans and chocolate chips. This should last a week in the fridge. Enjoy! Pie crust recipe came from Elena's Pantry . Check out her blog for yummy recipes! YUM! Pecan pie is such a classic down here in the South. I'm sure my family would even like this healthified version! Thanks! I hope they do too! Hi Melissa, have you tried making the making the chocolate pecan pie or classic pecan pie and freezing it? I haven't, but I am guessing either will freeze well. For the crust could I used spelt flour instead of the almond flour? Can't wait to try this!! can I use this recipe to make Chocolate Pecan Bars instead of pie? Do you think this recipe would work as mini-pies baked in the silicone muffin cups? I was thinking about trying that, but am concerned that they would be too hard to extract from the cups in one piece. Thanks! I think it could work. Let me know how it turns out if you try! Could I use regular flour in place of the almond flour?